We are leading manufacturer, trader, exporter and importer of Human Machine Interface. In order to cater the needs of our clients, we are offering a quality assured assortment of Mitsubishi HMI. 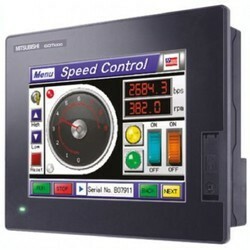 This product has the multi-unit connection up to 16 units, direct connection to multiple servos & inverter, vertical and horizontal mounting, increased memory capacity, data communications, multimedia function, multi-controller, document file display, operator authentication and available in multiple specifications to fulfill the requirements of clients. 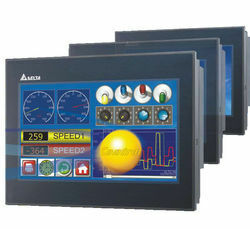 We are a renowned and customer centric firm, which is engaged in delivering a comprehensive range of Delta HMI. Human machine interface (HMI) is a medium for information exchange that has to be established between the users and electromechanical systems. Also, it allows the user to complete settings through touchable keys and images on a user-friendly window.